For years I've been wanting a fall table topper. One look at this month's Schnibbles pattern, Dimetore, told me this would be my year! All I needed was two fall themed charm packs, thank you Sandy Gervais! The pattern has a 4 x 4 block layout, for a total of 16 blocks. I thought a 5 x 3 layout would work better for my kitchen table. When I put the finished top my on my table, it just didn't look as good as I thought it would. 2 x 8 block layout. That's exactly what I had in mind, for my kitchen island. I had purchased enough background fabric for an outer border, but I decided I liked it just like this better. This is Lifetime Quilt Number 94. 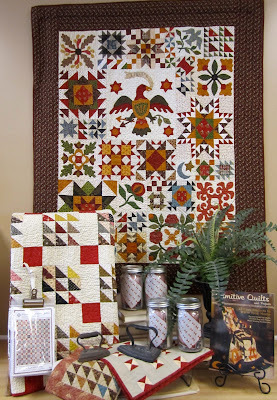 The pattern is Dimestore by Carrie Nelson for Miss Rosie's Quilt Co. The print fabric is Phenomenal Fall by Sandy Gervais for Moda. The background fabric is Great Harvest by Debbie Mum for South Sea Imports. This project finished at 18" x 64" and has approximately 381 pieces. I'm eager to see Sinta and Sherri's Dimestore parade, but more eager to find out what our September project will be, Miss Rosie just released a whole new line of patterns, Little Bites, I sure hope we get to take a little bite! The Spools projects keep rolling in! Sinta at Pink Pincushion finished her Spools with a flair, adding a checked inner border and floral outer border. I love it and wish I would have thought to do something similar. Sally at Chocolate Chip Addict has doubled her Spools production. I think they all look wonderful. When Nicole, Lisa, and I talked about asking folks to join in our Spools-Along, we figured we would wrap things up the end of Summer, around Labor Day. Well we still have some folks working away so we've decided to extend the Spools-Along until later in September, there's still time to join in the fun if you've not started! Hey, thanks for all the great wool comments, links, suggestions, and tips! As with most things I'm finding out the more I learn the more I find out I don't know! It's looking good that my Dimestore will be in the Schnibbles Parade, stop by tomorrow for a look at my finish. So last week I was in Spokane, Washington attending a retreat sponsored by the nice folks at the Buggy Barn. When Nicole and I decided to attend the retreat we knew we would attend the two Paula Barnes classes, we also knew we wanted a day to hit the local quilt shops and another day to attend the quilt show. That left one open day, we decided to fill the day taking a wool appliqué class. The only thing Nicole and I knew about working with wool was that we liked some of the finished projects we saw online, and if the class was a bust, oh well, it's always fun to try new things. This was the project we selected. This pattern is called 7 Snowmen and is by Bonnie Sullivan of All Through the Night Designs. Here are a few other patterns designed by Bonnie. This is Boo Kitty on Parade. Who doesn't love a Halloween cat wearing a polka-dot sweater! Here are some more amazing patterns by Bonnie. Bonnie must have brought at least 50 pieces from her collection, all equally amazing. Stacy of Buttermilk Basin was also teaching some wool classes. Here are a couple of her patterns. This pattern is September of a year long BOM, one for each month. 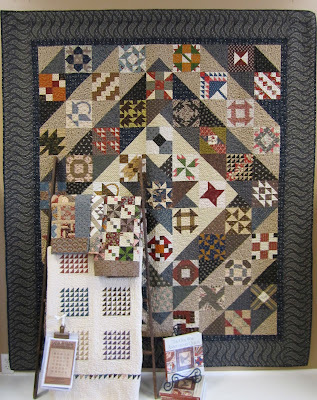 I just love the quilt block paired with a little wool pattern. She also designed these large Christmas Ornaments. Nicole and I were like sponges, peppering Bonnie with questions all day long. She was great about answering all our questions and giving us a great start on our projects. Here's what I accomplished in class! I've got aways to go but I'm very happy with what I've finished so far. One of the things I learned is that wool appliqué is a very expensive hobby, I won't complain about the cost of cotton fabric ever again. Bonnie had us use a little bit of glue to hold each cut piece in place while we stitched our pieces down, Stacy had her class use fusible web to attach their pieces. I'm very curious about using the fusible method, it seems it would make the pieces easier to stitch and the project more portable. Do you have a preference? I also learned that I have a whole lot more to learn about wool appliqué! This is the Buggy Barn! 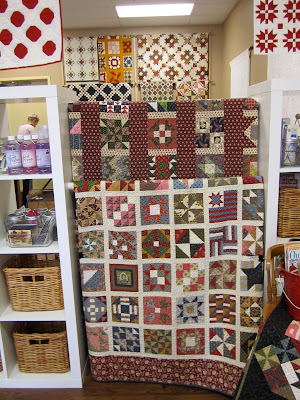 The Buggy Barn is "a unique quilt shop in the country", run by Pam Soliday and Janet Nesbitt in Reardan, Washington. They are also fabric and pattern designers. I spent last week at an amazing retreat organized by these two wonderfully sweet and talented ladies. This was the 16th year for this retreat, it was nothing but fun, I can't believe I missed the first 15! I'll blog more about my week of classes, the wonderful food, and the quilt show later this week. Since this is my normal Tools Tuesday slot, and since I got so many questions about it, today I'm going to blog about my sewing machine travel bag. I'm happy to report that I checked my sewing machine and it made it to the show and back home just fine, it even changed planes in Minneapolis! This bag is made by Omni-Glide. It's a lightweight, hard case bag on wheels with a great pop up handle for easy maneuverability. It comes in several sizes but I needed the X-Large for my Pfaff Quilt Expression 4.0. I added the pink daisies to the outside of the case and every single daisy also made it back home! That bag is then attached to the inside of the case with clips to keep it in place. Just to make sure my machine didn't move around at all, I also added the following in the case with the machine. At one of my first classes at a quilt show, on the list of class requirements, was listed a padded seat cushion. I brought one to that class and have brought one to every class I've had since. I placed that cushion on one side of my machine and around the top, the cords were also on the outside of the padded liner. My Omnigrid cutting/pressing mat went on the other side of the machine. I then used fabric for my class to pad each end. The fabric in the picture above was used to pad the sides on the way home, it's Lucy's Crab Shack by Sweetwater for Moda and it's going to be my new sewing machine cover. Anyway, with all that stuff stuffed in that case, my machine didn't move at all. The TSAs took a look inside the bag on the way to and from the retreat. 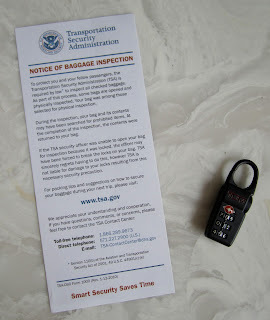 I had it locked with one of the TSA approved locks, nothing was amiss and the sewing machine made it so I guess it passed inspection. I spent no time last week looking at blogs or reading my email but I hope to get caught up this week. I also hope to finish this, Dimestore, the August Schnibbles of the month, the parade is just a few days away! 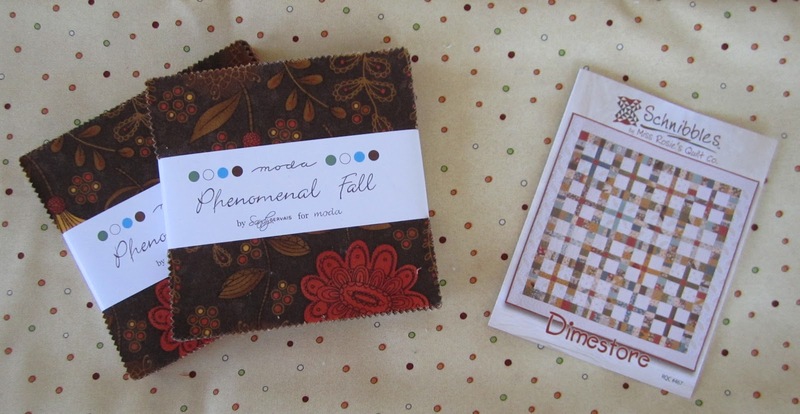 For those who asked, the background fabric I'm using is Great Harvest by Debbie Mum for South Sea Imports and it's a perfect match for that Phenomenal Fall line by Sandy Gervais. Plus it has dots, who doesn't love dots! In addition to the two Paula Barnes classes I attended last week, I also attended a wool class, my first, and I'm hooked! Stop back tomorrow for a look at my project. Nicole, from Sister's Choice Quilts blog, met me in Washington and we attended the classes together. Stop by her blog for her posts regarding our week of fun. So I got this wild idea about going back and reading my Summer of Fun goals blog to see how I was doing. I have been having a summer of fun, maybe a little too much fun, there are quite a few things on that list that haven't happened, and with less than 2 weeks left until Labor Day (my official end of summer) several things that aren't going to happen. But here are a few things that I hope will happen. I'm up to 27! Yes, I've added 6 since my last update, which was over a month ago! (me, hanging my head in shame) I have enjoyed making the 27 yoyos that are in that vase, and let me tell ya', they're perfect! The center is pulled tight with hardly any hole, the edges all align, the ridges all swirl the same direction. If there was a yoyo making contest I could give any one of those to the judge and just dare her to find a fault! That being said, I'm no where close to filling that vase by the end of summer, and there is not a yoyo judging contest in my neck of the woods, but I hope to add a few more. And yes, I think it's looking good for Amy who guessed 128. 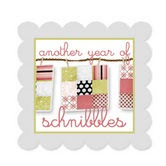 I've kept up with Sherri and Sinta's Schnibbles sew along with Leap Year in June and Hubble/Hubbel for July. For August the pattern is Dimestore and I'm using these Phenomenal Fall charm packs by Sandy Gervais for Moda. The dot fabric is my background fabric. 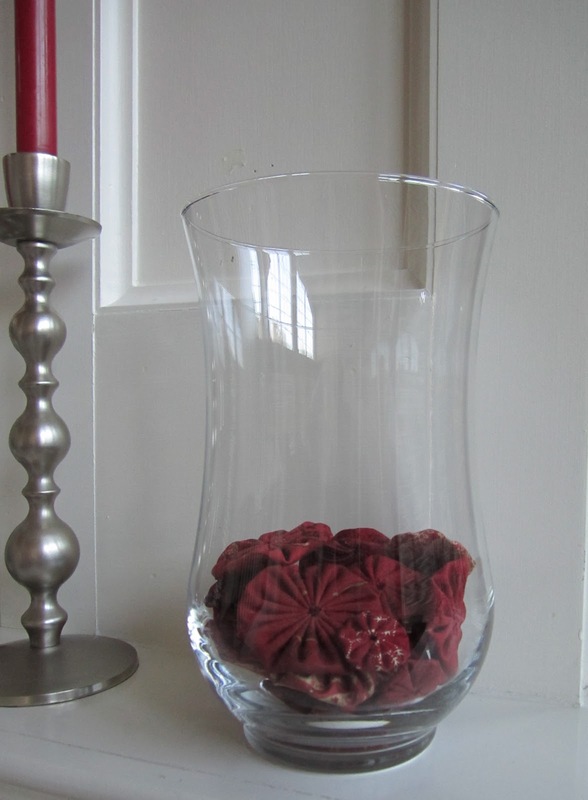 I'm going to finally have a fall table topper for my kitchen table! summer is not over until I have Northern Lights done. Same goes for this sewing machine cover, even if I have to stay up 48 hours straight Labor Day weekend, I'm not facing September 4th without this cover on my machine! Dawn at First Light Designs has a great start on hers, and it makes we want to make mine all the more. So with two weeks left, what's on you Summer of Fun To Do List, you better get hoppin'! 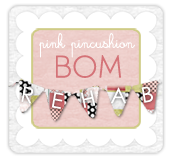 It's BOM Rehab reporting day! 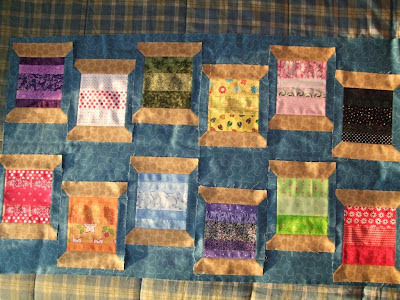 I'm not the only one working away on BOMs, check out Sinta's blog to see how other quilters are also making some progress on their projects. This week's block was easy. As a matter of fact, it was so fast and easy I made another one! This is block 7, the final main block! Now for the real fun, putting everything all together. I can hardly wait to see it finished, not to just have something off my To Do list, but I'm just so darn curious too see what this quilt is going to look like, it's such a dramatic change of pace for me. Do you think I'll be able to finish the whole thing without adding a smidgen of red? So far I've not been tempted in the least to add any color, I could not be happier with these blocks. For those stopping by for the first time, this is Northern Lights by Marti Michell. Select Northern Lights from my "Categories" list to see all the finished blocks. I started making blocks and couldn't stop so my Spools has an extra row of spools. Then I thought it needed a little something more, so I played around with some little spools blocks and threw a few of those in for fun. The pattern is Spools by Camille Roskelley for thimble blossoms. The print fabric is Bliss and Marmalade by Bonnie and Camille for Moda. The quilt finished at 59" X 66"
It has approximately 891 pieces. And next I have an update, from Sinta. When Sinta was finished connecting all her spools she thought it needed a little something something too, but instead of changing the inside of the quilt she decided to work on the outside of the quilt. She's added this little inner border and is not done yet. But I LOVE where she's going. I think she could quilt right now and have an adorable finish. I can hardly wait to see what else she adds! There's still plenty of time to join the fun, I bet you could whip out the small wallhanging, 16 block project, this weekend! 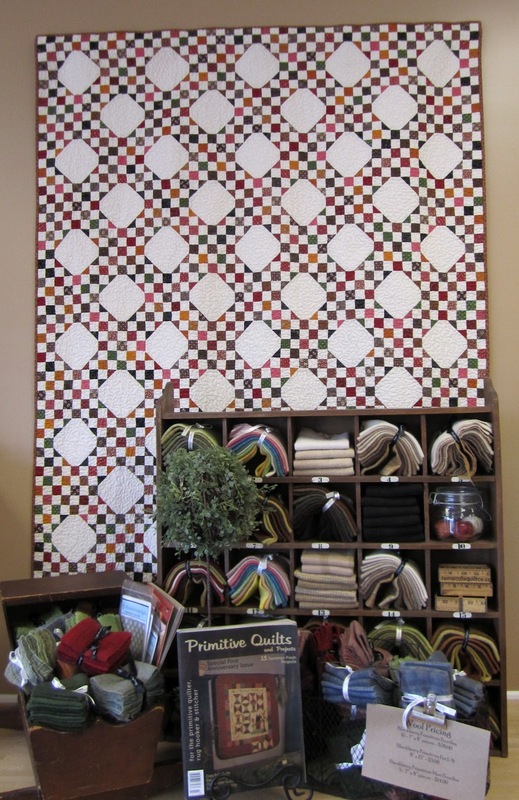 It's not very often I get to visit a quilt shop, but while I was in California I got to not only visit a quilt shop, I got to visit THIS quilt shop! 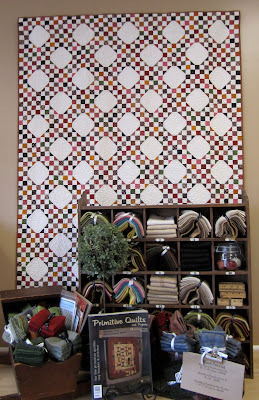 I've been following the goings on at this shop for ages through their blog, Diary of a Quilt Store, it was a real thrill to get to visit the shop in person. This shop had so many beautiful quilts on display I just wandered around and round, taking them all in. 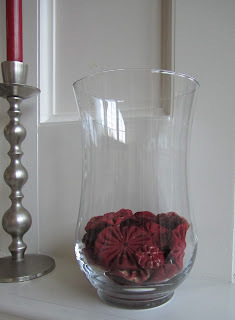 I was thrilled when I asked permission to take a few pictures for my blog and they said "take as many as you want"! It was their Red and White Tribute quilt promotion that motivated me to make my Red and White Tribute Quilt. 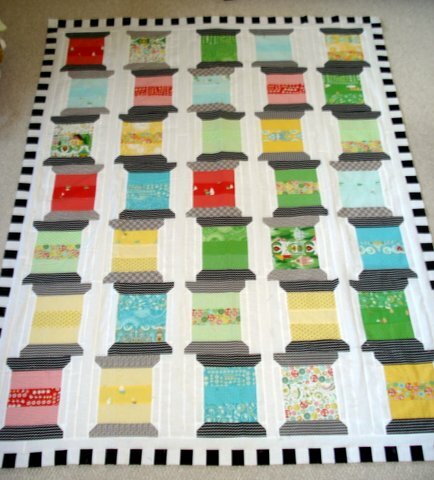 Most of the quilts and fabric that I see, I see online. Getting to see these patterns made up in person was just wonderful. I know what you're thinking, with me visiting such an amazing shop, "I can hardly wait to see what Thelma bought". Nothing! I didn't spend a nickel! They didn't have any kits and I was just so overwhelmed with the whole experience I just couldn't focus on buying yardage. Fabric shopping doesn't come easy to me, it's unusual for me to buy fabric that doesn't have a purpose, I'm weird that way! But it was still worth the stop.